Borderlands 2 joins its upcoming addition to the family, Borderlands The Pre-Sequel, to both Linux and SteamOS. To celebrate, Steam is also knocking a massive 75% off Borderlands 2 and all of its endless DLC packs. The game of the year edition of the game is selling for a cool £8.74 and $9.99 respectively. Valve’s SteamOS is already being tinkered with by curious players, and now the Linux based OS will be able to raid some vaults with Borderlands 2. It joins the upcoming Borderlands: The Pre-Sequel in the growing selection for SteamOS support. If you missed the boat on Borderlands 2, or are just missing some DLC content, you might want to take a gander over at the Steam store. 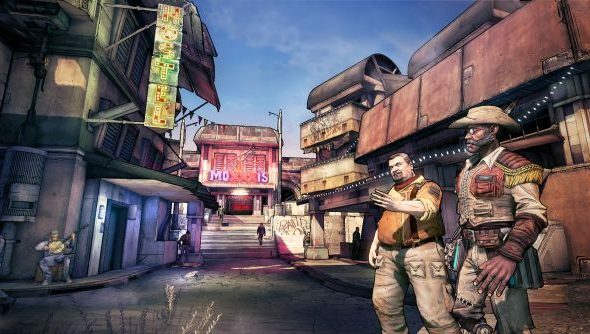 Borderlands 2 and all of its DLC has been slashed with a clean 75% off. If you’re new, I’d highly advised picking up the game of the year edition, along with a few friends. I might start another playthrough myself in preparation for the next game, which is out this month. Here’s a sneak peak at it to whet your lips.